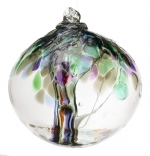 The gorgeous hand blown glass orb features an interior glass 'trunk,' which branches to support the translucent colors of the tree's leaves. Like trees in a forest, no two are the same. Attached Card Reads: Tree of Family: There is no greater comfort in life then the unconditional love and support of family. Like the roots of a tree, family nourishes and encourages us to grow to limitless possibilities. The Tree of Family reminds us that no matter how far we branch out as individuals, our family is always there for support, for encouragement, and above all for love. Size: 6 inch diameter. 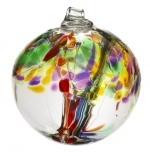 Handblown - color and pattern will vary. Handcrafted in Ontario, Canada. 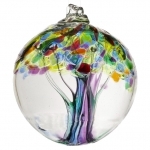 This gorgeous hand blown glass orb features an interior glass 'trunk,' which branches to support the translucent colors of the tree's leaves. Like trees in a forest, no two are the same. Tree of Strength: Strength is a powerful instrument we use to navigate the unexpected twists and turns of life. Just as a tree uses its trunk for support we use our inner strength to hold us steady. The Tree of Strength reminds us of our resiliency and our unique ability to rise above adversity no matter what.